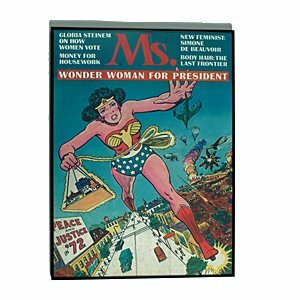 <----- That's a vintage Ms Magazine cover touting Wonder Woman for Prez in July 1972. We've come a long way baby ladies, but we're not there yet. While on the topic--i really liked what i've seen of Maryann Breschard's docu, Running in High Heels, which focuses on the political campaign of a recent college grad as she she runs for the state Senate. It also features a range of commentators including left-winger Heidi Hartmann, who runs the Institute for Women's Policy Research and the infamous right-winger Phyllis Schlafly of the Eagle Forum. In the New York area, Barnard, CUNY, and Fordham have copies of the DVD. If you've seen it in its entirety, please do cue me. Film looks great -- thanks for the tip. Kean Jr., is frightening, i agree. I'm sure people are dressing up as him for H'ween :). While i'd like to fantasize about a female Prez, i'm not always sure that HRC qualifies there--i seriously disagree with her standard policy on several issues and i have the feeling she'd be more Margaret Thatcher and Golda Meir rather than Mary Robinson or Ellen Johnson-Sirleaf. I'm picking up that people worry that nominating HRC would precipitate an effect akin to that of Nader in 2000 or 'Gay Marriage' in 2004. But it's a fight--she's willing to fight. I'm afraid that if we are constantly waiting for some moment of "preparedness" when everything is poised for a female presidential candidate, that moment may never come. And BTW, what's with the Dems?! I heard Bush on the radio say [paraphrase] that Dems always belive in taking action after the fact and that they are [direct quote] "genetically predisposed to raising taxes." What do the Dems do? Some spokesperson gets on the radio, whining about it being "unfair." Unfair? How about wrong, or STUPID? I guess I agree with you about preparedness, but as for Hillary and the Democrats in 2008 -- that's a longer conversation than I can have right now. As for "what's with the Dems," there are people hitting back a lot harder than that -- when they appear on "Countdown," for example. Don't underestimate how much the Democrats are fighting with "weapons of the weak" given the Republicans' autocratic control of Washington. Not always picked up by the media echo chamber. Thanks so much for pointing me to _Countdown_ and the _Imus show_--guess there's a lot more tv in my future than i had foreseen. It's not clear from your comments, so i'm kinda guessing here--you have somewhat Dem sympathies :P? At this point, i'm down to crossing my fingers.